Sporting Achievements and Trophies - Brighton technical school, Victoria, Australia. Brighton Technical School Football Team 1929. ​Frank Field (Front row, 2nd from left). Photo courtesy of Frank's son, John Field. Metropolitan Technical Schools Sports Association. Winner's Certificate. Name: A. Hynes. Year: 1957. 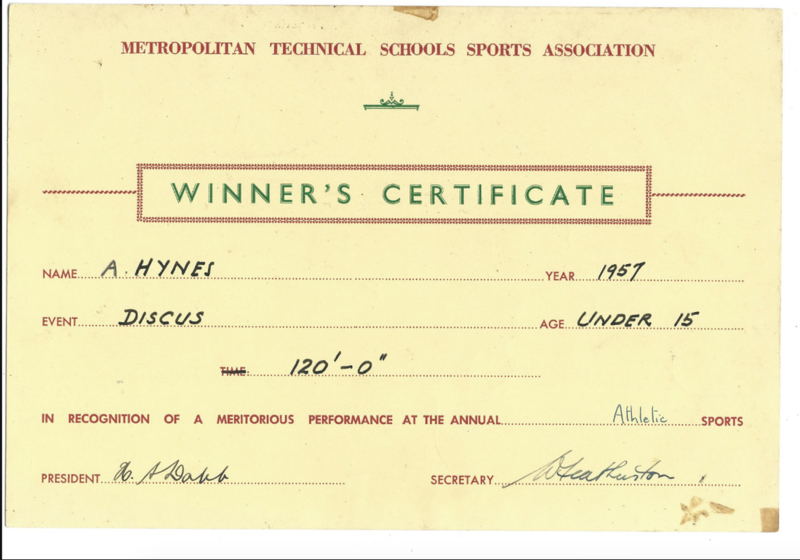 Event: Discus. Age: Under 15. 120 feet and 0 inches. In recognition of a meritorious performance at the annual Athletic sports. President: H. A. Dabb. Secretary: W. Featherston. The 1931 Cora Lynn senior basketball team which became State premiers in the schools' competition that year. See Seaspray 1945 page 11 for a review of the Cricket Season. FRONT ROW: RIGHT HAND SIDE, John Izon. FRONT ROW: SECOND FROM RIGHT, Albert King. FRONT ROW: CENTRE, Captain, Arthur Scott. See Seaspray 1946, page 12 for a review of the Cricket Season. CENTRE ROW: SECOND FROM RIGHT, John Izon. CENTRE ROW: SECOND FROM LEFT, Harry Sullivan, (Head Prefect in 1947 and 1948). CENTRE ROW: ON RIGHT HAND SIDE, Geoff Coulson. 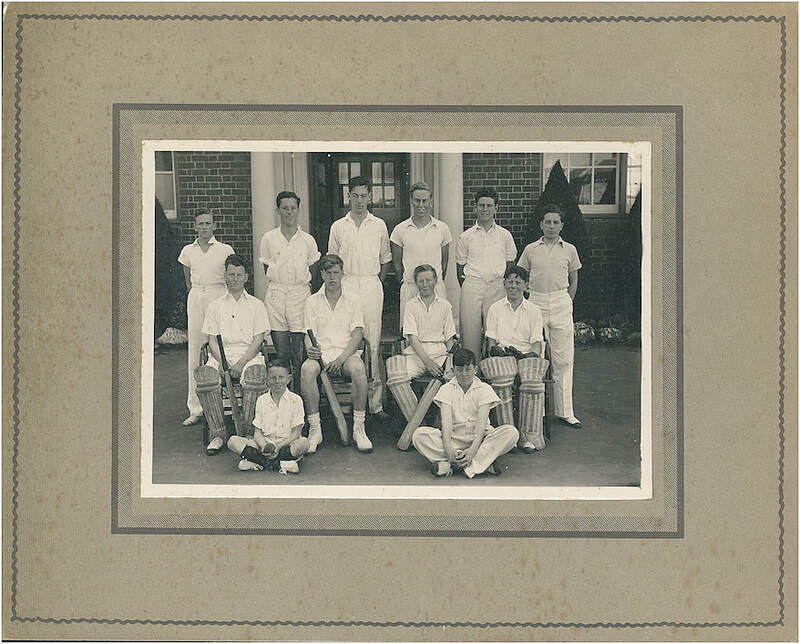 See Seaspray 1947, page 25 for a review of the Cricket Team's season. CENTRE ROW: CENTRE, Jo Roach, Team Manager and Woodwork Teacher. CENTRE ROW: SECOND FROM LEFT, Harry Sullivan, Head Prefect in 1947 and 1948. ​FRONT ROW IN THE CENTRE: John Izon. ​SECOND ROW FROM FRONT: wearing a suit, is Arthur Tyrer, Team Manager and Sheet Metal Teacher. On Arthur Tyrer’s left hand side, holding a football, is Harry Sullivan. 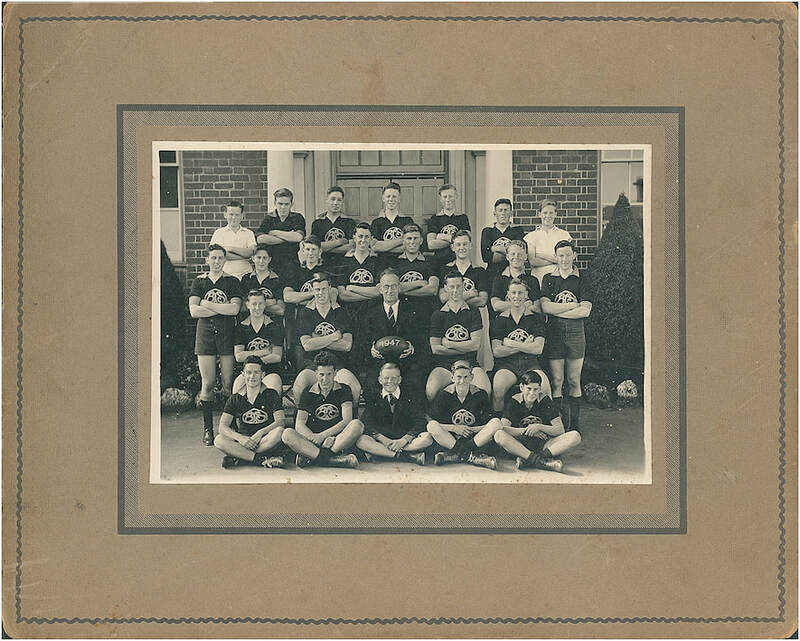 Back of photo of 1947 Football team. 1st XVIII. ​SECOND ROW FROM FRONT: Centre is Arthur Tyrer, Team coach, wearing a suit. SECOND ROW FROM FRONT: On Arthur Tyrer’s right hand side is Harry Sullivan. ​THIRD ROW FROM FRONT: FOURTH FROM THE RIGHT HAND SIDE, Lee Atkinson. 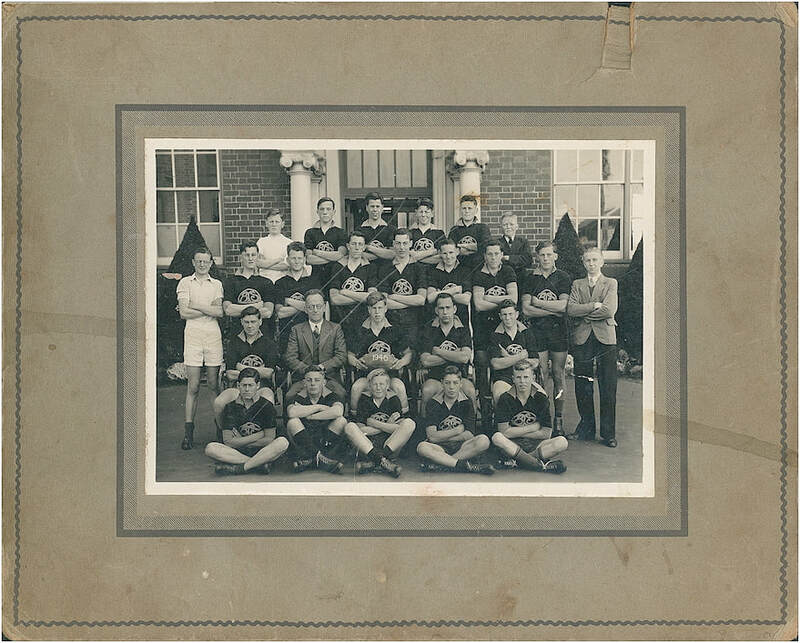 ​THIRD ROW FROM FRONT: SECOND FROM RIGHT HAND SIDE, Bruce Gatford, Head Prefect in 1949. ​BACK ROW: THIRD FROM THE RIGHT, John Izon, and, FOURTH FROM THE RIGHT is Geoff Coulson. Football Team 1958. Photo appeared in the 1958 edition of the Seaspray magazine. Photo courtesy of Karl Wakartschuk. ​BACK ROW: R. Schultz, R. Bankier, D. Tolley, S. Forsaith, R. Benson, D. Cerini. 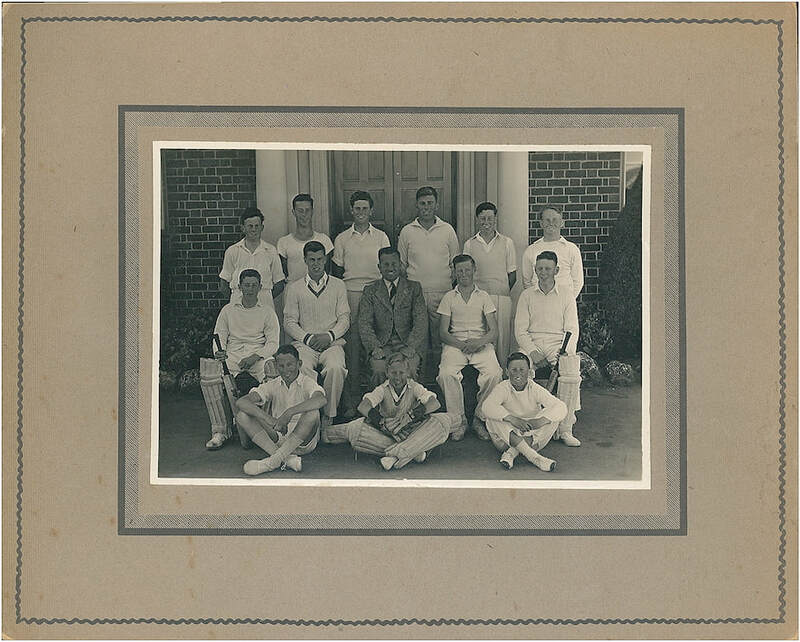 ​MIDDLE ROW: R. Dickinson, B. Jones, J. Reid, G. Lenk, B. Gadd, F. Martin, G. Warren, A. Hynes. ​FRONT ROW: B. Francis, T. Brady, T. Jewell, Mr. D. Hall, J. Spence, J. Evans, D. Maxwell, D. Curwen. A postcard purchased from England via ebay in 2014.
nucleus we went through the season undefeated to retain the Hartley Shield. Webster." See reverse side of the postcard. "Love to Aunt Ann from Ron". With thanks to Bob Tidball for this series of 15 sports photographs. BRIGHTON TECHNICAL OLD BOY’S FOOTBALL CLUB --1928 -- BACK ROW: T. McCubbin, J. Thornton, R. Bolwell, A. Smith, F. Biencourt, R. Thoms, A. Nash, S. Butterworth, SECOND ROW FROM BACK: L. Adams, W. Thornton, C. Taylor, A. Gibson, N. Darroch, W. Woolfe, D. Johnson, C. Sutton, SECOND ROW FROM FRONT: S. Phelps, W. Johnson (Sec. ), R. Goldsworthy (Captain), F. M. Smith (President), H. Dudgeon (Vice-Capt. ), FRONT ROW: F. Macaulay, W. Secker, R. Hoggins. Brighton Technical School Junior Football Team 1926. Back Left: Mr. F. M. Smith. Brighton Technical School Football Team 1927. Centre of bank row: Mr. F. M. Smith (Senior Master). 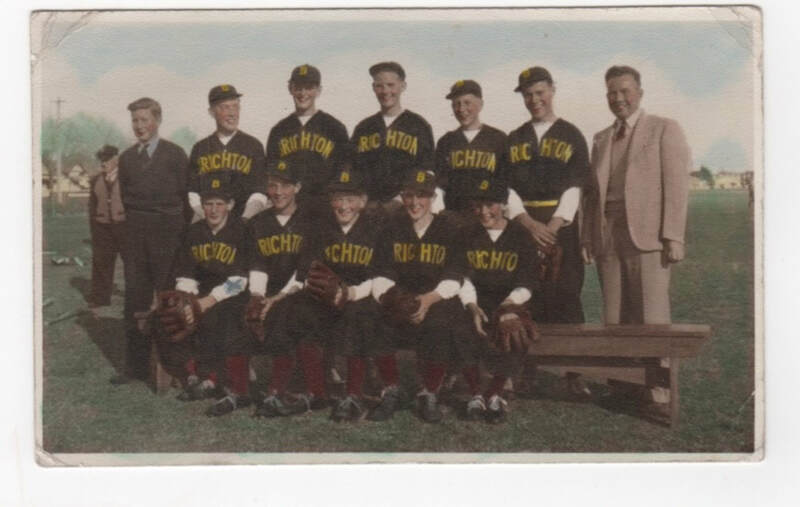 V. Chick (coach) was a World War II soldier. He died on the Burma Railway. For more information about Vivian Chick click on this link. BRIGHTON TECH. OLD BOYS F.C. --1933-- B. Section Amateur Association. Runners-up to Geelong. B.T.S. OLD BOYS FOOTBALL CLUB 1930 RUNNERS UP M.A.F.A...BACK ROW: D. Johnson, H. Vickers, N. Darroch, W. Woolfe, F. Biencourt, L. Smith, R. Thoms, R. Bleckley, J. Thornton, A. Gibson, L. Adams. 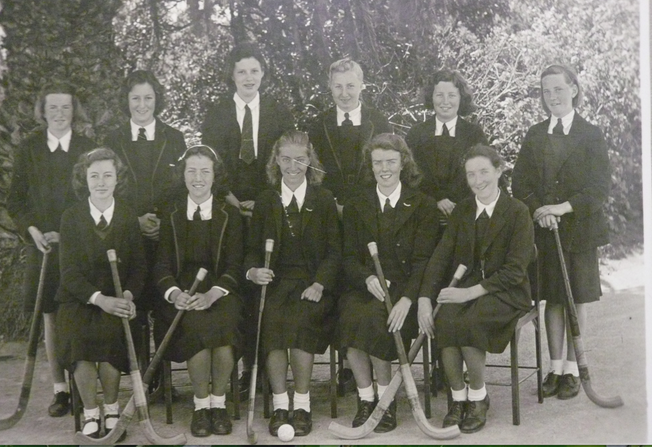 CENTRE ROW: E. Secker, (crouching and wearing a white jumper), V. Chick, W. Johnson (Sec. ), S. Phelps (Capt. ), F. Smith (Pres. ), J Robbie (Vice-Capt. ), G. Cowl, (Coach), C. Taylor, J. Shields (crouching and wearing a white jumper). FRONT ROW: F. Macaulay, H. Dudgeon, W. Secker, R. Hoggins, C. Hindson. B.T.S. Senior Football Team 1925. Mr. F.M. Smith (Pres.) holding the ball. Presented to Mr. F.M. Smith (president)... Brighton Technical Old Boys Football Club 1927...BACK ROW: S. Butterworth, J. Thornton, T. Milburn, R. Thorns, H. Woolfe, R. Abbott, C. Payne, W. Johnson, L. Gordon. MIDDLE ROW: H. Forster, S. Phelbs, C. Atkinson, C. Adams (Coach), R. Goldsworthy (Captain), A. E. Smith (President), R Hoggins, F. Macarly, C. Sutton. 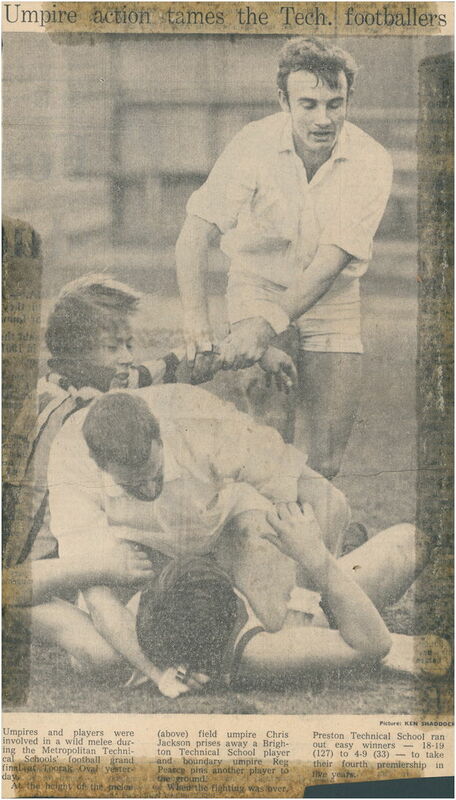 FRONT ROW: T. Pratt, Theo Milburn, L. Adams, E. Brookman, H. Dudgeon (Vice-Capt. ), R. Bobwell. B.T.S. 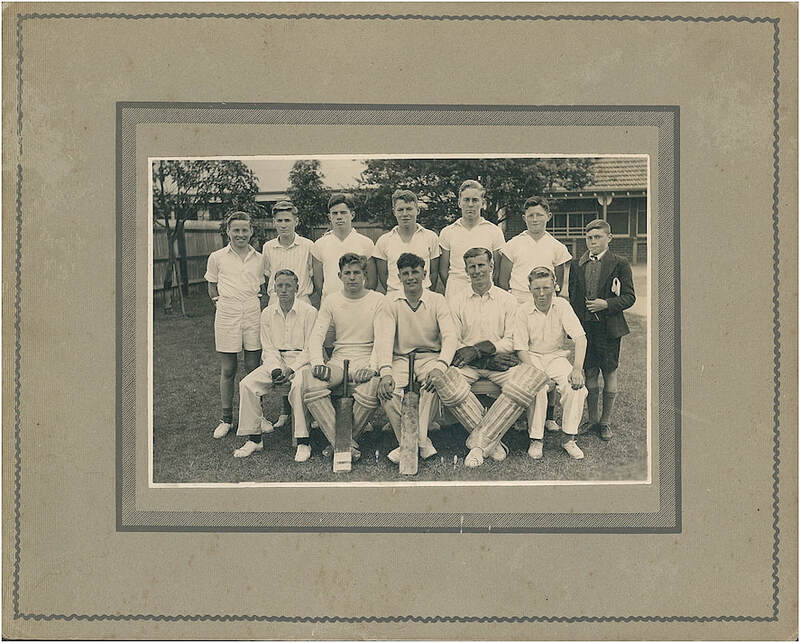 Cricket Team 1924... Mr. F. M Smith Senior Master, front row 3rd from left. CRICKET: This year an inter-school competition was formed. The first round to be played before, and the other round after the football season. Through able coaching and great consistency on the part of the team, we succeeded in winning the first round. We won six games outright, drew two, and lost the other by only one run. This performance placed us at the top of the list with twelve points. The following represented the School in the first round: Meadows (c), Cox (v-c), Dudgeon, Hunt, H.O., Johnson, H., Hardie, Hare, Cannon, Croft, Coates, Robbie, Casbolt. We opened the season with drawn games against Footscray and Prahran, and a victory over Sunshine. We defeated, on first innings, both Brunswick and Caulfield. With South Melbourne we drew, but West Melbourne defeated us by one run. In the last match of the round we beat Collingwood on the fist innings. The most noteworthy performance with the bat was that of H. Dudgeon, with 121 not out against Footscray. Several fine feats of bowling were displayed; the best was, probably, that of Cox, five for seven, against Caulfield. Next term the team will again go into training, and they feel quite confident of securing the Cricket Cup. Sea Spray 1924 page 19. B.T.S Athletics Team c. 1924.... V. Chick centre - wearing a suit. Photo believed to be B.T.S Old Boys' Football Club... Mr. F. M. Smith (2nd row from front and 6th person from the left). B.T.S Football Team 1924. Mr. F.M. Smith (Pres.) (Senior Master) holding the football. Photo courtesy of Bill Johnston. 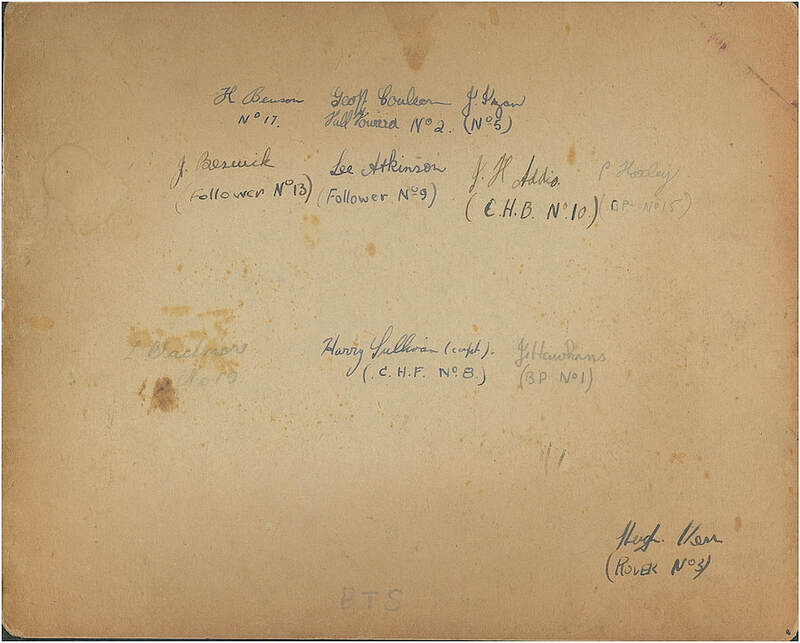 Photo believed to be B.T.S Old Boys' Football Club. Just seventeen years ago the first issue of “Sea Spray” was printed. Many members of the Old Boys’ Association treasure copies of that magazine – Vol. 1, No. 1, 1923. It has been a link uniting them to their old School. “Sea Spray” has continued to carry on the work pioneered seventeen years ago – it has proved an inspiration and guidance to succeeding generations of students. This number of “Sea Spray,” will be a farewell magazine to many who have worked and played for three spacious years. Though most of the exit-students will be linked to the School by attendance at the evening classes and by membership with the Old Boys’ Association, yet for them school-days are over; they must take the stream. You students about to leave, are equipped for the business of gaining a sound knowledge of your purposed calling; but, if you have caught the true spirit of your School, the School has done more than that for you; it has equipped you for the wide and exacting responsibilities of civic life; there has been opened up for you vistas of literature and science which, if followed, will make full and truly recreative your hours of leisure. “Where lied the land to which this ship must go? Our first Editorial, seventeen years ago, imbued us with the love of School. We were very young, we had no traditions, few “old boys.” “Sea Spray” has played a part in creating an institution that contains all that is best in school life, a place that lads are eager to enter, feel privileged to attend, and proud that they were educated within its walls. In red and white hotpants, two St. Kilda supporters, Dianne Bailes, 15 of Hampton, left, and Kaye McConnell, 15 of Ripponlea, carry a big plastic bag with their streamers at the MCG today. 1972? Look What Happened in the Grand Final! ... The year was 1971. 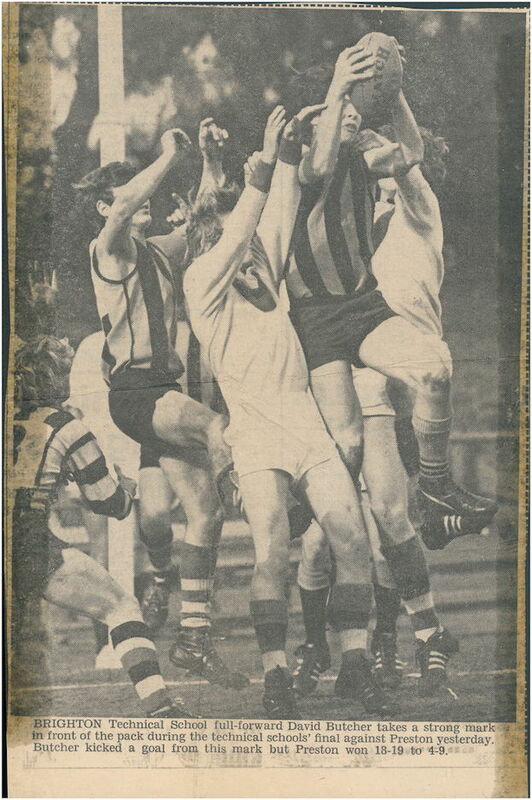 ...Players and umpires were involved in a brawl at Toorak Park, Prahran, yesterday, during the Technical Schools' Football Grand Final... Brighton goals: Weideman, Butcher, Harber, Holmes. Best: Griffin, Foster, Kent. Brighton Technical School full-forward David Butcher takes a strong mark in front of the pack during the technical schools' final against Preston yesterday. Butcher kicked a goal from this mark but Preston won 18-19 to 4-9. The year was 1971. 'Wayne Comes on Cold in a Warm Guernsey.' When your side only has 18 guernseys and you are 19th man you don't wast time with sympathy when a team-mate is hurt. You drag him off the field, drag his guernsey off his back and get into the action. Here Wayne Mowbray, of Brighton Technical School, shows how it is done as injured team-mate Alan Haines waits for the "stretcher-bearers." Brighton lost to Preston Tech. 18.19 to 4.9-33. The year was 1971. Brighton Technical School. Girls' School. "Cora Lynn". 45 Cochrane Street, Brighton, Victoria. The School's Hockey Team. 1947. Back Row: Left to right, ?, ?, Irma Morrel, ?,? Jean Phillips. Front Row: Left to right, Shirley Joy (nee Parsons), Marie Bunn, ?,?, Peggy Carter.